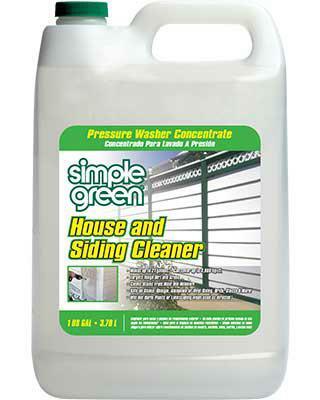 Simple Green House and Siding Cleaner is specially formulated to remove environmental pollution, dirt and grime from vinyl and aluminum siding, stucco, terra cotta roof tiles, and painted wood. It is also a perfect choice for use on shake, shingle or panel siding. This powerful formula was developed primarily to be used with pressure washing systems but can also be used for manually as a high performance house, siding, and roof cleaner. Cleans up to 3,800 sq. ft. Ideal for use on home exteriors including stucco, vinyl siding, aluminum siding, painted wood, and shake or panel siding. It can also be used on vinyl, plastic, and painted or treated wood, outdoor furniture, terra cotta or shake roof tiles, arbors, gazebos, and more.